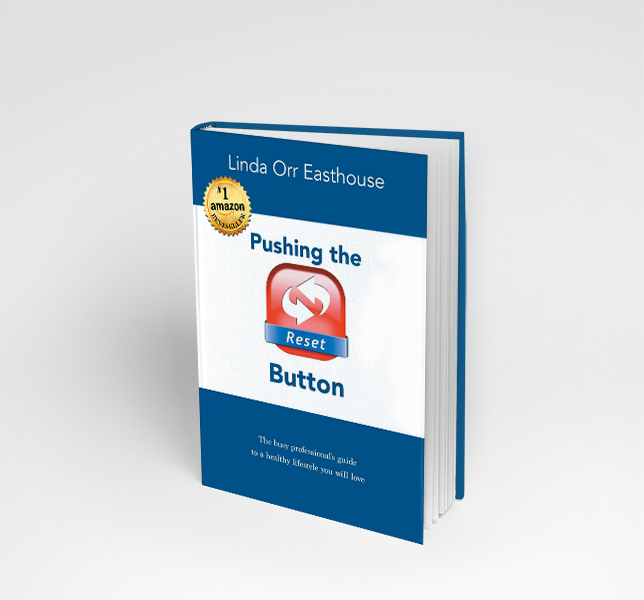 Pushing the Reset Button Now Available! With lots of helpful tips for stress management, diet, exercise, and detoxification, Pushing the Reset Button: The busy professional’s guide to a healthy lifestyle you will love, is a practical guide to better living. Linda Easthouse spells out all the do’s and don’ts of this modern society for you in simple, easy-to-understand terms, sharing with you her extensive knowledge of everything from toxins that are lurking in our cupboards and medicine cabinets, which we should replace with healthier choices, to delicious foods we have been brainwashed into rejecting that are actually good for us! She lays out a plan to de-stress your day and put you back in control of your life. The plan was originally designed for professional women, stressed by the demands of work and family. These women were looking for healthy alternatives without using drugs or medications. Follow the plan and in just 31 days anyone can be Pushing the Reset Button and begin living the life of his or her dreams. “Kinesiology, isn’t that what sport’s therapists do?” In Issue #22, Dec 2013, Health Naturally Magazine. “Body Relaxation Technique”, and “Emotional Stress Relief” in Living Well the Natural Way. NaturalHealthCare Canada, 2010. Nutrition 101 for New Canadians, Center for Newcomers, Calgary. Once a quarter, Linda volunteers to speak to the intermediate and advanced English classes on nutrition. Many newcomers to Canada are confused by the food here. Learning a new cuisine, trying out the fast food, and eating a generally different diet often leads to digestive upsets, obesity, and other dietary issues. Linda guides them through making good choices for their new diets. Linda has twice presented to the Seniors on the Road to Health. Getting older does not mean you have to get sick and stiff. Practical classes on diet, energy, and emotional health assist the seniors to live active healthy lives. Linda has done numerous Corporate Lunch and Learns introducing professionals to self-care technique for stress management. Stress stops at your desk.